Since American film noir has focused on scholarly discussion for nearly six decades now, the appearance of any new study offering original insights and new perspectives would appear to offer a major challenge to anyone. However, in his new book that contains material that has already appeared in Cinema Journal 47.4 (2008) and American Literary History 19.3 (2007), Jonathan Auerbach offers some significant fresh insights into territory one would have thought to now be fully excavated. Dark Borders relates the stylistic aspects of noir to changing definitions of American citizenship within a changing historical and political context beginning with the 1939 film Confessions of a Nazi Spy (USA 1939) and concluding with Touch of Evil (USA 1958), a film usually regarded as the end of the classic phase but also pointing the way towards later transcultural and transnational dimensions. The book begins with a stimulating introduction – “The Un-Americanness of Film Noir – in which the author analyzes post-war America as an “uncanny place” (5) pertinently linking the concept of “un-American” with Freud’s definition of the “unheimlich” in a specific historical context. “Cinema scholars frequently link noir to existential alienation, abstractly or philosophically considered, but such alienation needs to be more precisely grounded in specific historical and cultural fears about enemy aliens lurking within.” (6) A definite link exists between a late 1930s rise of an intelligence apparatus and its cold War successor stimulated by a specific type of “age of anxiety” common to pre-and post-war regimes. 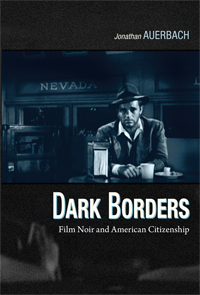 By welcoming the “problematic hybridity” (11) of film noir rather than yearning for convenient classifications, viewers are in a much better position to appreciate the author’s interesting examination of this selected “particular tendency of film noir” that he pursues in the following chapters. These include the pre-war nightmare worlds of Confessions of a Nazi Spy and Stranger on the Third Floor (USA 1940) whose bleak visions of the security state anticipate what will occur in the post-war era; the white-collar murderous plot foiled by Edward G. Robinson’s representative of the developing corporate state in Double Indemnity (USA 1944); visions of demobilized soldiers working “through their wounds by returning more directly to alien spaces” (92) as in The Chase (USA 1946) and Key Largo (USA 1948); the instability concerning American citizenship that border crossing noirs such as Border Incident (USA 1949), Hold Back the Dawn (USA 1941), Secret beyond the Door (USA 1948), and Out of the Past (USA 1947) present in specifically challenging grim, unheimlich, stylistic terms endemic of this boundary pushing genre; and the jarring visions of bad boy patriotism seen in This Gun for Hire (USA 1941), Ride the Pink Horse (USA 1947), and Pickup on South Street (USA 1953), the last film distinguished by a telling observation by Auerbach “thanks to the magic of DVD freeze frames” (171) that reveals Fuller’s similar knowledge of the link between pre-war and post-war security measures that form a key argument of Dark Borders. In the Postscript “Darkness Visible” Auerbach refers to the familiar still of Robert Aldrich holding a copy of Panorama du Film Noir in his hands while on the set of Attack! (USA 1956) He not only draws the obvious (to those of us who do not run with critical fashions) that “the photo clearly belies the common misconception that noir was a concept unknown to Hollywood practitioners until Paul Schrader introduced it in his seminal essay of 1972” (193) but also reveals the actual transculturalism of noir itself in his discussion of Kiss Me Deadly (USA 1955). Indeed, an illuminating footnote on pp.241-242 argues against the monolithic use of commercial and institutional frameworks as constituting this film’s “cultural framework” as opposed to outside influences from French culture itself. The same can be said for the current fashionable reaction against the auteur concept as Auerbach argues in another stimulating footnote (239.n.33) as well as the damaging neglect that concentration “on the institutional and historical complexities of studio production” (174) can limit significant stylistic analysis as well as understanding a director’s “cagey intentionality” that Pickup on South Street demonstrates. However, two errors need correction for the next edition. Soldier needs to correct “solider” on p.92. In Touch of Evil, the Night Man repeats “they got another think coming” not “thing” (202). Also, the nightclub scene in Out of the Past surely deserves some discussion in addition to the ones in When Strangers Marry (USA 1944) and Kiss Me Deadly since it is there that Jeff guesses that Kathy has gone to Mexico despite her African-American maid’s protective attitude. However, these are minor in terms of the achievement Dark Borders represents and its inevitable stimulus to necessary and relevant further discussion of the significant argument represented by this book.